How might we rethink the way we live, work, play, and sustain in the urban environment in the years to come? What unforeseen challenges might we need to address in the next 50-100 years? To kick-off this unique challenge and warm up our model-making skills, the office was broken up into teams during an all-office meeting. The teams competed with one another to build the highest possible tower, but with limited time and post cards and paper clips as our materials. While this was a fun exercise for everyone involved, it was also a great way to show how quickly a model can be adapted and reiterated. 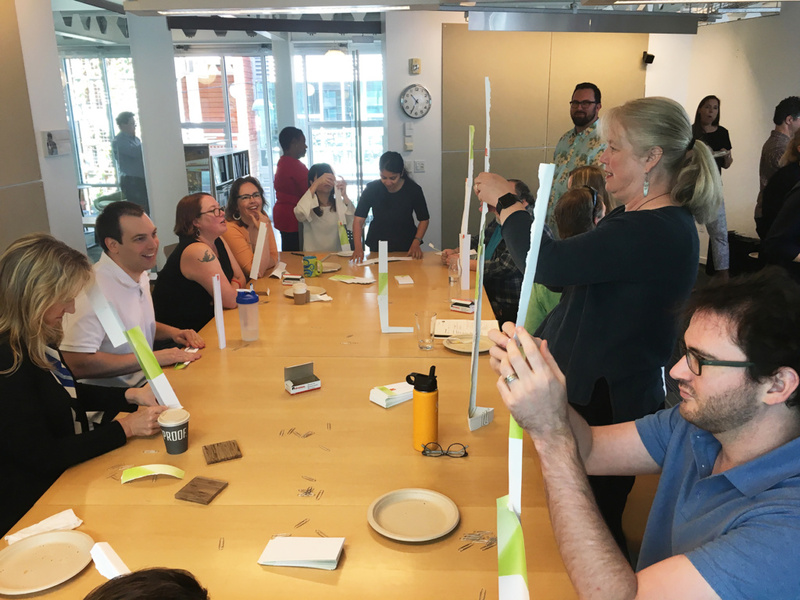 The Terry Thomas Charrette continued into its conceptual design phase as everyone gathered to brainstorm some initial ideas. 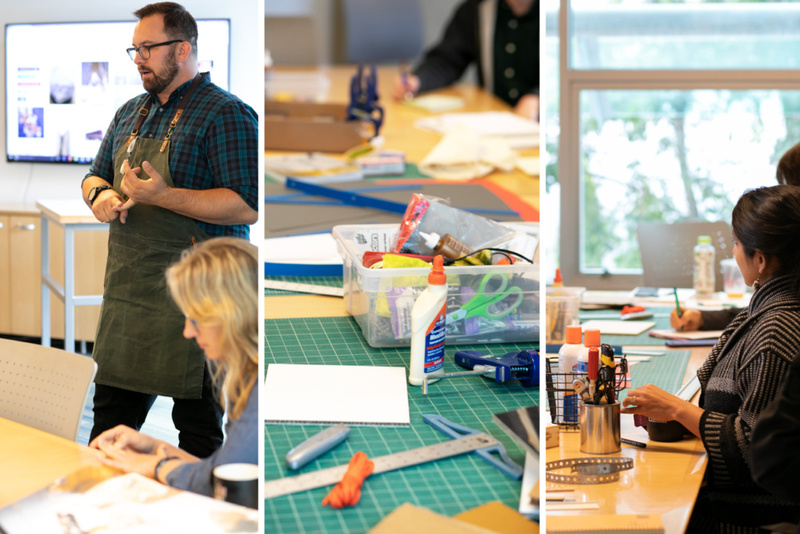 We outfitted the conference room as a model shop to accommodate the concept generation phase – modeling materials lined the table, with tools to cut and paste them together. With the objective clarified and questions answered, groups split off to bounce ideas off of each other and collectively take the next step of this design process. The results of everyone’s hard work were finally ready to be unveiled. 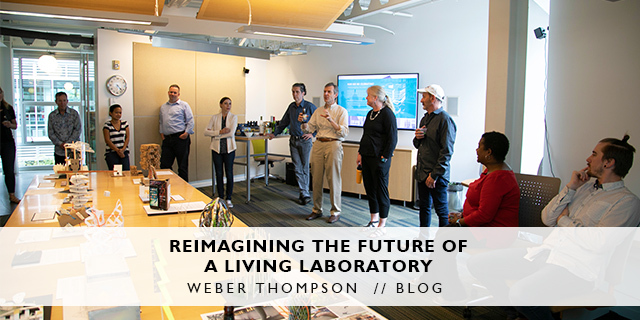 WT staff and two special guests, Christopher Meek from the University of Washington’s Integrated Design Lab and Tom Marseille from WSP, gathered for a happy hour presentation of the models. The models were lined up around the edge of our conference room table as everyone read the descriptions and viewed the variety of submissions. A very eclectic mix of both materials and model-making processes were apparent, but each had its own creative and abstract thought to accompany it. As we went around the table, everyone was able to speak about their concept and what drove their thought process. 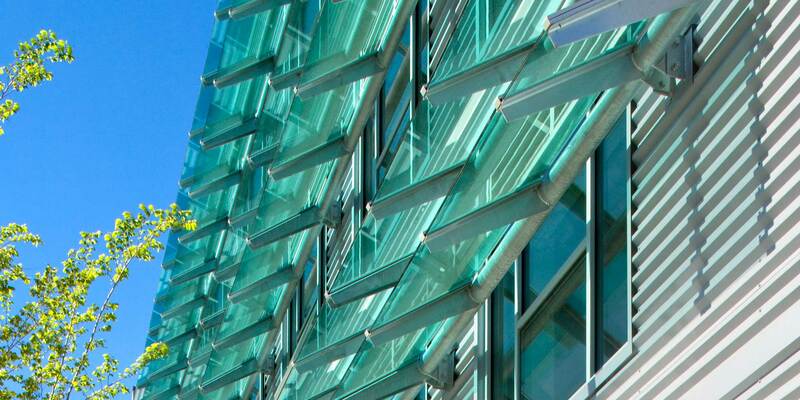 The problems which drove these thought processes were as varied as the designs themselves! After some deliberation from our principals, the winner of the challenge was announced at the next all-office meeting. The winning concept is Topophilia by Nicole Winn! This idea expresses the importance of attachment to place and how we can acknowledge and protect nature in the built environment. Learn more about Topophilia here. Throughout the rest of the summer, we’ll be developing the winning concept into a final conceptual design. We’ll create a virtual reality-based model that will be displayed in our office in September, at our Anniversary Party on September 7th (RSVP here), and developed into an entry for the Seattle Architecture Foundation annual model exhibit. The goal is to encourage big thinking and big ideas – and so far we’re well on our way. Weston Hambleton is an intern at Weber Thompson for the summer and a current UW Graduate Student at the College of Built Environments.